Chinese Vice Premier Liu He will resume negotiations with his U.S. counterparts in Washington on Wednesday as both governments push for an agreement to end their protracted trade dispute. The latest round of talks follow discussions last week in Beijing, where Liu met with U.S. Treasury Secretary Steven Mnuchin and Trade Representative Robert Lighthizer. Outstanding issues include protection for intellectual property and how to enforce any broader trade agreement. 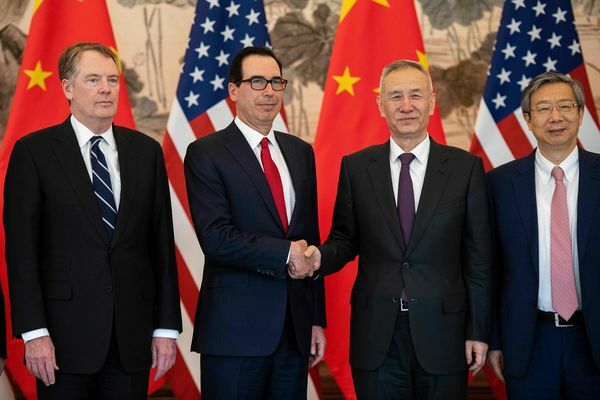 Liu He, center right, shakes hands with Steven Mnuchin as Yi Gang and Robert Lighthizer pose in Beijing on March 29. China touted “new progress” after last week’s talks and both sides have been working line-by-line through the text of an agreement that can be put before Trump and Xi, according to people familiar with the matter. China has already announced various concessions and pledged to open up industries in steps. Both countries have yet to agree on what happens to existing U.S. duties on Chinese goods and the terms of an enforcement mechanism to ensure China keeps to the trade deal, the Financial Times reported, citing people briefed on the talks. Other than that, U.S. and China officials have resolved most of the issues surrounding the deal, the FT reported. Negotiations so far have focused mainly on what China will do to reduce its goods trade surplus with the U.S., which reached a record $419.2 billion last year. Beijing has made some big offers in this area, such as a pledge to reduce the deficit to zero by 2024 — close to the end of a potential Trump second term. That would involve a dramatic, and some say impossible, ramping up of purchases of agricultural goods, commodities, aircraft and other items. Nevertheless, China has already made moves in this area, including with plans to import record amounts of U.S. pork and re-entering the market for U.S. soybeans. Boeing Co.’s role in this equation has now been complicated by China’s grounding of its 737 Max jet. A major sticking point has been a U.S. demand that it retain the power to police the application of the deal. The U.S. wants regular meetings to assess whether China is living up to promises, and wants to be able to impose tariffs on China — with no threat of counter-retaliation — if it fails to do so, White House chief economic adviser Larry Kudlow has said. That has left negotiators diametrically opposed: China wants all tariffs that have been imposed in the course of the past 12 months removed, while the U.S. wants to retain some as part of its enforcement mechanism. Trump advisers say China has failed to meet commitments in the past, one reason they decided early in the president’s term to emphasize the stick over the carrot. The U.S. has stoked expectations that the deal will include the strongest ever rules preventing China from devaluing its currency to gain a trade advantage or evade the impact of tariffs. While Trump has long bashed Beijing for alleged distortion of the yuan, the U.S. has held back from officially naming it as a currency manipulator. In the talks, China has pushed back hard against any one-sided clause that would bind its hands. Yi Gang, governor of the People’s Bank of China, hinted that the final agreement would resemble previous Group of 20 clauses that committed states to avoid competitive devaluation.